The attainment of blood transfusion safety in Nigeria (and probably the rest of Sub-Saharan Africa) remains an uphill task due to a number of factors, ranging from shortage of blood, poor implementation of blood transfusion guidelines, infrastructural deficits to high prevalence of transfusion-transmissible infections (TTIs), particularly hepatitis and human immune deficiency viruses. We reviewed available data on blood transfusion practices and safety in Nigeria using the PubMed, PubMed Central, Google Scholar, and African Index Medicus search engines, through a combination of word and phrases relevant to the subject. The World Health Organization has been in the forefront of efforts to establish safe, available, and affordable blood transfusion services in most parts of Africa through encouraging adequate blood donor recruitment, donor blood testing, and collection as well developing strategies for the rational use of blood. Even though modest improvement has been recorded, particularly with regards to donor blood screening for common TTIs, considerable efforts are needed in the form of robust public enlightenment campaigns (on blood donation) and continuous system improvement to drive the current transfusion practices in the country toward safety and self-sustenance. The World Health Organization (WHO) had projected that Sub-Saharan Africa will attain sustainable blood transfusion safety by the year 2012, through the implementation of sets of policies geared toward provision of safe, affordable, and readily available blood units in hospitals to serve the needs of patients., Up till now, however, this goal is far from achieved in Nigeria and a number of other African countries, with attendant negative impact on health indices. Effective healthcare delivery globally is known to be supported by a robust supply of safe blood units which could indeed be lifesaving in a number of clinical scenarios. Correspondingly, from the road traffic accident victim with acute hemorrhage at the emergency room to the obstetric patient with antepartum/postpartum hemorrhage or the under-five child presenting with anemic heart failure, prompt administration of appropriate units of blood could well make the difference between life and avoidable demise. Earlier, extensive inquests into the causes of the high maternal mortality in Nigeria and Sub-Saharan Africa had highlighted the huge contribution of the very ineffective blood transfusion services., The maternal mortality rate in Nigeria (630 deaths/100,000 live births) is unacceptably high and indeed ranks high among contemporary developing economies. It is, therefore, instructive to emphasize that the expected improvement in the low health indices in Nigeria (particularly high maternal and infant mortalities) may continue unrealized until significant improvements take place in the country's blood transfusion services.We searched PubMed, PubMed Central, Google Scholar, and the African Index Medicus electronic databases, using a number of word and phrase combinations: “Blood safety,” “transfusion practices,” “blood donation,” “donor screening,” “transfusion-transmissible infections (TTIs)” “transfusion(s),” “developing countries,” and “Nigeria.” The information from these publications was discussed in this review and recommendations made based on identified gaps in efforts toward achieving blood transfusion safety in Nigeria. In the private sector, the donor population was made up of 75% commercial donors and 25% of replacement donors. Voluntary unpaid donors were insignificant. The National blood policy is essentially made up of sets of action plans which are all geared toward the provision of safe, available, and affordable blood donor units, where and when they might be needed in the country. 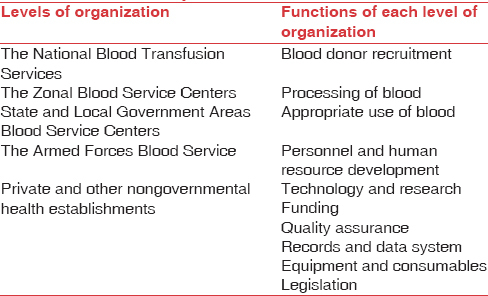 It is structured into blood transfusion services under the following strata [Table 1]; (i) the national blood transfusion service (NBTS), (ii) the zonal blood service centers, (iii) state and local government areas blood service centers, (iv) the armed forces blood service, and (v) private and other nongovernmental health establishments. The essence of the above stratification was to ensure universal coverage of the country, right to local government councils. There are 3 main classifications of blood donors in Nigeria; the voluntary (nonremunerated) donors, family (replacement) donors and commercial (paid) donors. The voluntary donors are the altruistic individuals who donate blood with the sole aim of saving a life, without regard to any form of inducement. They are usually mobilized through the mass media or blood donation drives to schools, churches and mosques. An earlier study had hypothesized that the dearth of voluntary donors in Nigeria and Sub-Saharan Africa is probably associated with the fact that the mentality of altruism (regarding blood donation) is not yet generally accepted in the typical African culture, compared to what is obtainable in the most developed countries. The family (replacement) donors include those that donate for a hospitalized family member, friend, or associate and is largely nonremunerated, depending entirely on the good will of friends and family members. Osaro et al. had concluded that the continued importance of family donors in Sub-Saharan Africa could be linked to the fact that it may actually cost less to procure and is also well adapted to the extended family support system of many Nigerian and African communities. Persistent blood shortages coupled with increased poverty in Nigeria (and most African countries) created another population of donors who give blood strictly for financial gratification; these constitute the commercial (paid) donors. These have continued to increase in number and prominence in Nigeria, fuelled by the very huge deficit in blood supply and utilization. Ahmed et al. succinctly captured this phenomenon in a report among blood donors seen at the University of Maiduguri Teaching Hospital, Northeast Nigeria over a 12 years period. They observed a progressive decrease in the percentage of voluntary blood donation, over the study period, from 31% to 5%, against an increase from 20% to 63% in the frequency of commercial blood donation. The above study equally emphasized the wide gap between blood supply and demand in Nigeria by showing that the mean annual increment in the number of blood donations (4%) was well below the mean annual increment in in-patient numbers (11%). Similarly, Emeribe et al. chronicled blood donation and distribution in a 400-bed teaching hospital in South-South Nigeria and reported that the general blood supply was unacceptably low, whereas the surgical departments (surgery and obstetrics and gynecology) utilized a larger pool of all donated blood (70.4%) over the study period of 4 years. These observations unarguably show the blood donation dynamics and similarly offer some insight into the problems bedeviling the attainment of blood transfusion safety in the country, which is mainly poor supply of donor units. Commercial (paid) blood donors, therefore, flourished and thrived in this atmosphere of supply deficit, to the detriment of blood transfusion safety in the country. The high prevalence of TTIs in blood donors and the general population in Nigeria has unarguably impacted negatively on blood transfusion safety. Indeed, prevalence rates as high as 18%, 23%, and 12.3% for the human immunodeficiency virus (HIV), hepatitis B virus and hepatitis C virus (HCV) respectively have been reported among prison inmates in Nasarawa, North-central Nigeria. The prevalence rates of some TTIs across different parts of the country are shown in [Table 2]. According to the NBTS, Nigeria, with a population of over 150 million people uses about 1.5 million units of blood every year to cater for the health needs of its citizens. This well approximates to far less than a pint of blood per person and further highlights a very poor blood supply chain in the country., It, therefore, implies that the present pool of mainly commercial blood and family donors cannot bridge the nation's blood supply deficits, in fact, poor blood supply is probably the key hindrance to the smooth operations of the National blood transfusion policy aimed toward boosting transfusion safety in the country. A number of studies have shown why Nigerians will not voluntarily and regularly donate blood, as is obtainable in more developed countries. Olaiya et al. evaluated the attitude of individuals in Lagos (Southwest Nigeria) toward blood donation and identified a number of factors, ranging from fear of contacting TTIs (52.4%) to fear of side effects such as weight loss (23.8%), sudden death (3.3%), sexual failure (5.9%), high blood pressure (5.2%) and convulsions (1.5%) as impediments to blood donation. A similar study in Calabar, South-South Nigeria identified diverse religious beliefs as the most common reason for refusal of blood donation. Current NBTS guideline mandates the screening of all donors units for anti HCV, hepatitis B surface antigen, anti HIV, and syphilis, using a combination of rapid qualitative immunochromatographic test kits, enzyme-linked immunosorbent assays and antigen assays. While this is the practice in most of the blood banks in the country (particularly those attached to tertiary hospitals), however, nucleic acid tests (NATs) are not yet universally available for TTIs testing. NATs have the added advantage of increasing the detection of TTIs, especially during the window periods. The use of autologous blood transfusion has been noted to improve transfusion safety as a result of the significantly reduced chances of blood transfusion reactions, red cell sensitization to alloantibodies and transmission of TTIs. Studies in Nigeria showed that this practice is both a safe and cost effective way of improving blood supply and safety and therefore needs to be encouraged.,, Obed et al. evaluated the rate of autologous blood transfusion at the University of Maiduguri Teaching Hospital, Maiduguri, Northeast Nigeria among Obstetric patients and reported an overall prevalence rate of 20.7%, out of which preoperative blood donation accounted for 95.8% whereas 6.4% of the units were predeposited. The rate of autologous blood transfusion was even lower in a study conducted at Zaria, North Central Nigeria (0.58%). Intraoperative cell salvage which involves the aseptic collection of blood lost during or after surgical operations with the aim of re-infusing same into patients has been shown be a feasible way to reduce the risks associated with homologous blood transfusions in Nigeria. This is particularly important in patients with blunt abdominal trauma or ruptured ectopic gestation. The practice of intraoperative cell salvage in Nigeria is low currently, a multicenter study that involved surgeons and anesthetics reported usage rate of just 0.01%. Erythropoietin is a 30.4-kDa glycoprotein hormone produced by the kidney and liver which has a stimulant effect on erythropoiesis by inhibiting apoptosis of erythroid precursors, particularly at the colony-forming units-erythroid stage. When given to appropriately selected patients, it has been found to significantly boost the hemoglobin concentration, thereby reducing the transfusion requirements during surgery. Udosen et al. had reported successful surgery facilitated by the use of erythropoietin resulting in hemoglobin concentration increase from 70 g/L to 140 g/L, over a period of 6 weeks, in a patient (of Jehovah's Witness faith) in Calabar, South-South Nigeria. There is indeed paucity of report on the use of erythropoietin in Nigerian patients, and this most probably indicates that the practice is relatively unpopular. Increasing the pool of voluntary blood donors in Nigeria is the key to bridging the blood supply gap and could translate into better blood transfusion safety. A number of studies have identified some factors that appear to hinder people from donating blood in the country, an intense campaign using the mass/social media is therefore recommended to counter these erroneous ingrained belief systems. More so, adequate emphasis should be given to voluntary blood donation and intensive education on the risks and means of acquiring TTIs (during such enlightenment campaigns) with a view to reversing the high dependence on commercial blood donation and reducing the high prevalence rates of TTIs. Donor blood screening should be further strengthened, while NATs should be made more universally available in the blood banks in the country. Moreover, antibody screening and identification should be made routine, particularly for at-risk groups. Encouraging the use of autologous blood transfusion and erythropoietin could go a long way in reducing overdependence on homologous blood transfusion (along with the potential risks it possesses) and the frequency of transfusions in Nigeria. Urgent concerted action is needed in Nigeria to correct the blood supply deficit and increase the pool of voluntary (nonremunerated) blood donors. This is expected to significantly improve blood transfusion safety and positively impact on health indices in the country. More so, encouraging more universal use of autologous blood transfusion, intraoperative cell salvage and erythropoietin is imperative to reduce the huge demand on homologous blood. Tagny CT, Mbanya D, Tapko JB, Lefrère JJ. Blood safety in sub-Saharan Africa: A multi-factorial problem. Transfusion 2008;48:1256-61. Tapko J, Mainuka P, Diarra-Nama AJ. Status of Blood Safety in the WHO African Region: Report of the 2006 Survey; 2006. Available from: http://www.afro.who.int/en/divisions-a-programmes/dsd/ health-technologies-a-laboratories.html. [Last accessed on 2015 Dec 02]. Umeora OU, Onuh SO, Umeora MC. Socio-cultural barriers to voluntary blood donation for obstetric use in a rural Nigerian village. Afr J Reprod Health 2005;9:72-6. Bates I, Chapotera GK, McKew S, van den Broek N. Maternal mortality in sub-Saharan Africa: The contribution of ineffective blood transfusion services. BJOG 2008;115:1331-9.
WHO, UNICEF, UNFP and The World Bank Estimates. Trends in Maternal Mortality: 1990 to 2010. Available from: http://www.who.int/maternal_child_adolescent/epidemiology/profiles/maternal/nga. [Last accessed on 2015 Dec 02]. National Blood Transfusion Service, Federal Ministry of Health [Nigeria]. The National Blood Policy. Abuja: National Blood Transfusion Service, Federal Ministry of Health; 2006. Ahmed SG, Ibrahim UA, Hassan AW. Adequacy and pattern of blood donations in North-Eastern Nigeria: The implications for blood safety. Ann Trop Med Parasitol 2007;101:725-31. Osaro E, Charles AT. The challenges of meeting the blood transfusion requirements in sub-Saharan Africa: The need for the development of alternatives to allogenic blood. J Blood Med 2011;2:7-21. Emeribe AO, Ejele AO, Attai EE, Usanga EA. Blood donation and patterns of use in Southeastern Nigeria. Transfusion 1993;33:330-2. Adoga MP, Banwat EB, Forbi JC, Nimzing L, Pam CR, Gyar SD, et al. Human immunonodeficiency virus, hepatitis B virus and hepatitis C virus: Sero-prevalence, co-infection and risk factors among prison inmates in Nasarawa state, Nigeria. J Infect Dev Ctries 2009;3:539-47.
WHO. Universal Access to Safe Blood; 11 February, 2010. Available from: http://www.who.int/bloodsafety/universalbts/en/index.html. [Last accessed on 2013 Dec 06]. Buseri FI, Muhibi MA, Jeremiah ZA. Sero-epidemiology of transfusion-transmissible infectious diseases among blood donors in Osogbo, South-West Nigeria. Blood Transfus 2009;7:293-9. Kassim OD, Oyekale TO, Aneke JC, Durosinmi MA. Prevalence of seropositive blood donors for hepatitis B, C and HIV viruses at the Federal Medical Centre, Ido-Ekiti, Nigeria. Ann Trop Pathol 2012;3:47-55. Okocha EC, Ejele OA, Ibeh CC, Aneke JC. Prevalence of hepatitis B surface antigen (HBsAg) seropositivity in sickle cell anemia patients in Benin city, mid-Western Nigeria. Ann Trop Pathol 2013;4:83-7. Bolarinwa RA, Aneke JC, Olowookere SA, Salawu L. Seroprevalence of transfusion transmissible viral markers in sickle cell disease patients and healthy controls in Ile-Ife, Southwestern Nigeria: A case-control study. J Appl Hematol 2015;6:162-7. Olaiya MA, Alakija W, Ajala A, Olatunji RO. Knowledge, attitudes, beliefs and motivations towards blood donations among blood donors in Lagos, Nigeria. Transfus Med 2004;14:13-7. Okpara RA. Attitudes of Nigerians towards blood donation and blood transfusion. Trop Geogr Med 1989;41:89-93. Laperche S. Blood safety and nucleic acid testing in Europe. Euro Surveill 2005;10:3-4. Ugwu NI, Awodu OA, Bazuaye GN, Okoye AE. Red cell alloimmunization in multi-transfused patients with sickle cell anemia in Benin City, Nigeria. Niger J Clin Pract 2015;18:522-6. Kangiwa U, Ibegbulam O, Ocheni S, Madu A, Mohammed N. Pattern and prevelence of alloimmunization in multiply transfused patients with sickle cell disease in Nigeria. Biomark Res 2015;3:26. Jeremiah ZA, Mordi A, Buseri FI, Adias TC. Frequencies of maternal red blood cell alloantibodies in Port Harcourt, Nigeria. Asian J Transfus Sci 2011;5:39-41. Parker-Williams EJ. Autologous blood transfusion. Postgrad Doct Afr 1989;11:52-6. Adias TC, Jeremiah Z, Uko E, Osaro E. Autologous blood transfusion – A review. S Afr J Surg 2006;44:114-6, 118. Obed JY, Geidam AD, Reuben N. Autologous blood donation and transfusion in obstetrics and gynaecology at the University of Maiduguri Teaching Hospital, Maiduguri, Nigeria. Niger J Clin Pract 2010;13:139-43. Babadoko AA, Hassan A, Aminu SM, Dahiru IL, Randawa AJ, Suleiman AM. Autologous blood transfusion in Zaria, Nigeria. Afr Sanguine 2009;12:1. Available from: http://www.afsbt.org. [Last accessed on 2015 Jan 06]. Selo-Ojeme DO, Onwudiegwu U, Durosinmi MA, Owolabi AT. Emergency autologous blood transfusion in the management of ruptured ectopic pregnancy. J Obstet Gynaecol 1997;17:353-5. Amucheazi AO, Ajuzeiogu VO, Ezike HA, Odiakosa MC, Nwoke OM, Onyia E. A survey of blood conservation methods in clinical practice in some urban south-eastern government hospitals in Nigeria. Asian J Transfus Sci 2011;5:35-8. Mocini D, Leone T, Tubaro M, Santini M, Penco M. Structure, production and function of erythropoietin: Implications for therapeutical use in cardiovascular disease. Curr Med Chem 2007;14:2278-87. Udosen A, Inyama M, Etiuma A, Urom S, Marwa D. Non-transfusion orthopaedic surgery in complicated fractures among Jehovah's witnesses in Calabar, Nigeria: Case report. Internet J Orthop Surg 2008;11:2. Available from: http://www.ispub.com/IJOS/11/2/10204. [Last accessed on 2015 Dec 03]. Aminu M, Okachi EE, Abubakar SM, Yahaya A. Prevalence of hepatitis B virus surface antigen among healthy asymptomatic students in a Nigerian University. Ann Afr Med 2013;12:55-6. Eke AC, Eke UA, Okafor CI, Ezebialu IU, Ogbuagu C. Prevalence, correlates and pattern of hepatitis B surface antigen in a low resource setting. Virol J 2011;8:12. Pennap GR, Yakubu A, Oyige O, Forbi J. Prevalence of hepatitis B and C virus infection among people of a local community in Keffi, Nigeria. Afr J Microbiol Res 2010;4:274-8. Ejele OA, Nwauche CA, Erhabor O. Seroprevalence of hepatitis C virus in the Niger Delta of Nigeria. Niger Postgrad Med J 2006;13:103-6. Ophori EA, Atanunu O, Johnny EJ, Adu M. Seroprevalence of syphilis in apparently healthy students from a tertiary institution in Benin city, Nigeria. Jpn J Infect Dis 2010;63:437-9. UNAIDS. Report on the Global AIDS Epidemic; 2008. Bada AS, Olatunji PO, Adewuyi JO, Iseniyi JO, Onile BA. Hepatitis B surface antigenaemia in Ilorin, Kwara state, Nigeria. Cent Afr J Med 1996;42:139-41.